EveryPolitician is an ambitious project to gather and share data on — well, the clue’s in the name — every politician. That’s every politician in the world; current, and, eventually, historic; upper legislatures as well as lower. Why would we embark on such a challenging project? Because mySociety is committed to helping people all around the world to build and maintain their own democracy websites, just as we do in the UK with TheyWorkForYou. Reliable data about politicians can be difficult to source. It’s also one of the building blocks that everyone needs if they are planning to build a parliamentary monitoring website. Many people underestimate the work involved in this step: how hard can it be to put together a spreadsheet of current politicians and their details? Very hard, as it turns out — very hard indeed, at least, if you want your site to stay current when politicians resign or are replaced at elections, change their name or party, or do something else to disrupt your carefully-compiled data. And that’s always supposing that your country’s parliamentary data is readily available in the first place. You might be surprised how many countries don’t publish this simple information online and in an accessible format. That’s why we’re finding reliable sources, standardising the data, and putting it out for anyone to use. Of course, there’s another organisation that publishes data of all sorts, free to re-use, and that’s Wikidata. We’re currently working in collaboration with Wikidata in an arrangement that’s mutually beneficial: we can feed new data in, and add richer or more structured data to what’s already there; and we can also benefit from their amazing global cohort of volunteers who tirelessly update and improve this source of open, structured data every day. There’s always plenty to do — if you fancy becoming a Wikidata volunteer too, working on the EveryPolitician project in particular, get in touch and we’ll let you know what’s top of the list at the moment. Millions of pieces of data so far, and there’s more every day. See what’s there. You can download the data as a csv file, or as richer JSON data. 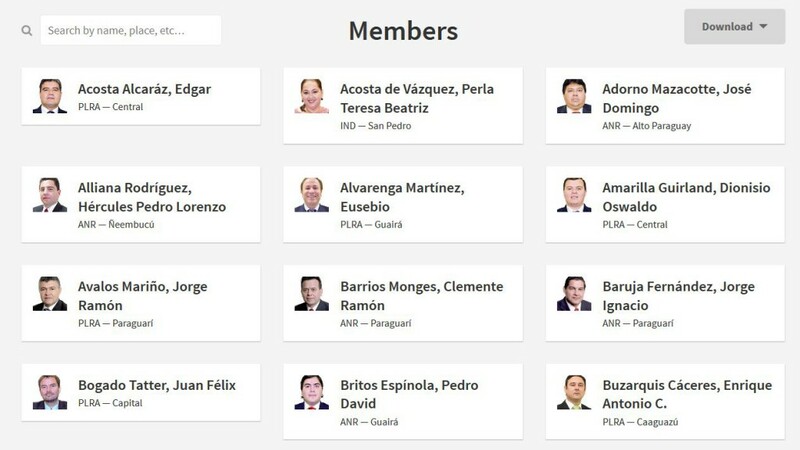 You can download it once, or on an ongoing basis, depending on your needs — and EveryPolitician can even inform you automatically when there are any changes to a specific parliament. EveryPolitician is powering all kinds of projects around the world. Here are just a few of them. This simple game has a very serious purpose: to gather the first dataset to show how women are represented across the world’s parliaments. The names and photos are all pulled from EveryPolitician — and in a neat feedback loop, the data Gender Balance gathers becomes part of the richer information held within EveryPolitician. Set up a site that lets people write to their politicians, anywhere in the world. The whole conversation is published online, meaning statements and promises are available for all to see. Representatives’ names and email addresses are drawn from EveryPolitician. A Ukranian site whose name translates as ‘TheyVoteForYou’, this project allows citizens to see just how politicians — fed in from EveryPolitician, of course — have voted as draft bills go through parliament. The Zimbabwean parliamentary monitoring site relies on EveryPolitician to provide accurate information about each member of its National Assembly. Investigative journalists can cross-match our lists of politicians to other sources (e.g. investigating shell companies for a Private Eye article or with the Panama Papers). mySociety’s collaboration with Facebook makes it easy for people to connect with their representatives. 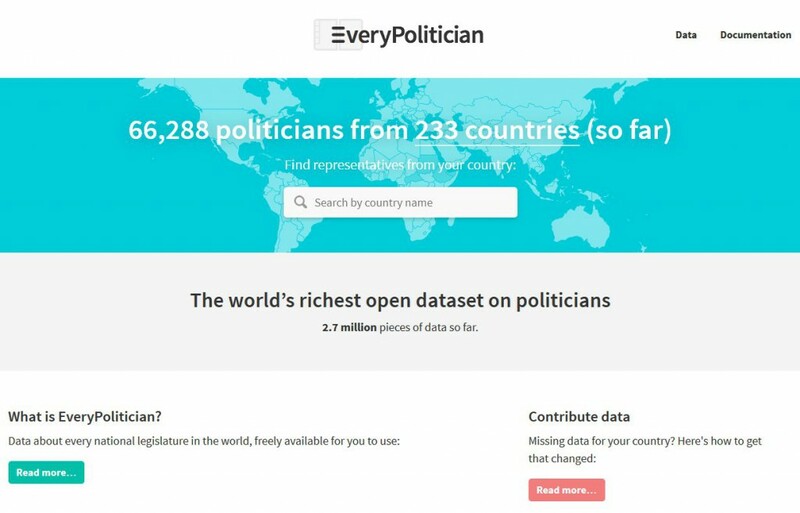 If you’d like to use the data on EveryPolitician, for any purpose, please go ahead — it’s all open and free to use. We’d love to know what you’re using it for, and we might even be able to give you a helping hand, so do drop us a line at team@everypolitician.org. If the data you need isn’t there please get in touch. We’ll either suggest ways you can help get it, or we’ll add it to our own task list. If you’d like to get involved, you’ll be doing developers and citizens everywhere a great service! Again, drop us a line and we’ll get you started.